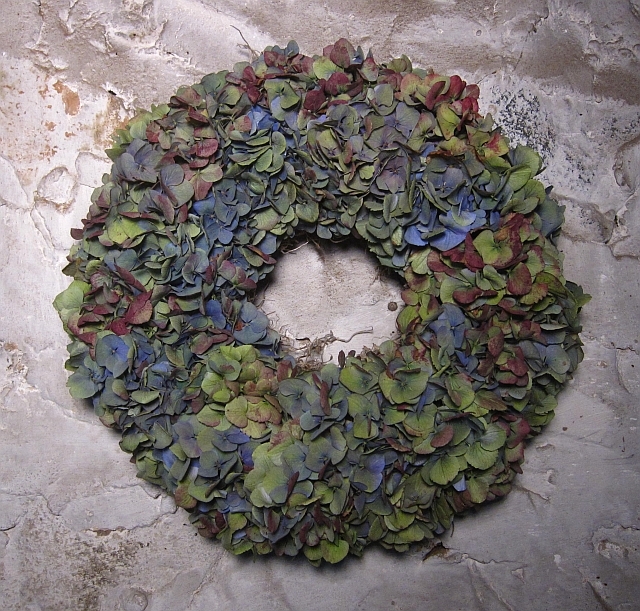 Hydrangea blooms make lovely indoor wreaths that will last all year until the hydrangea bush blooms again next summer. 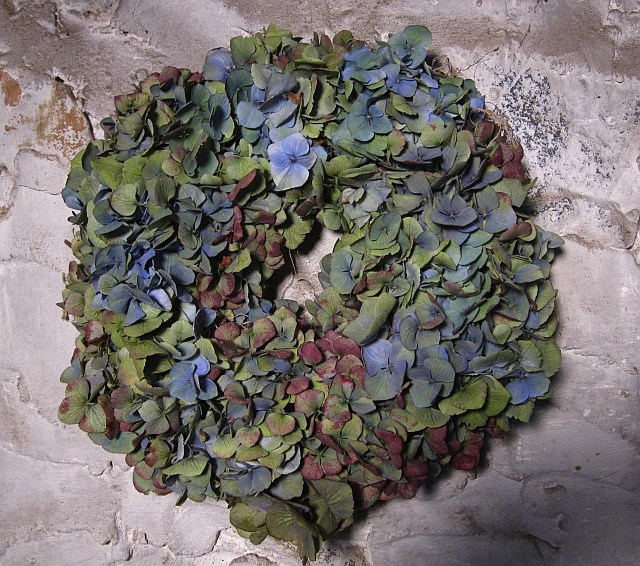 My mom, a floral designer, taught my son and me how to make dried hydrangea wreaths last weekend. It is not difficult. My son will show you how it is done. 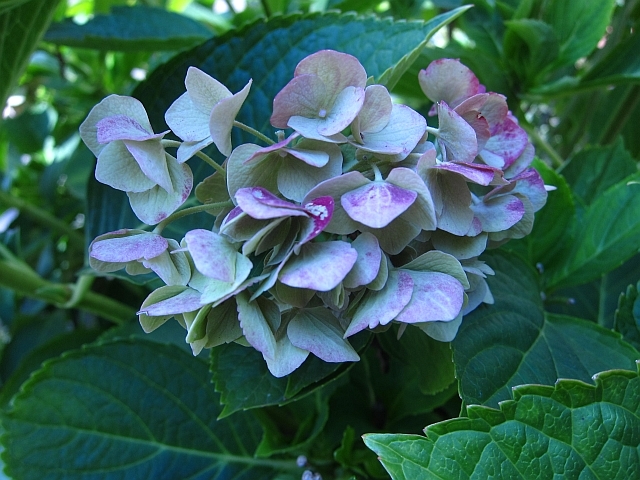 Pick hydrangea when the blooms feel thick and “leathery” and the bloom color is muted (blue turns pale green and pink turns light violet). Pick the full bloom at the main stalk. Rinse and soak it in cold water for a few minutes, then place it in a towel and gently squeeze to remove excess moisture. Add a hook to the floral form. Make the hook from a 10 to 12 inch long piece of floral wire that has been wrapped with floral tape. Bend one end of the wire to make a loop and wrap the other end around the wreath. Close each end with a twist. 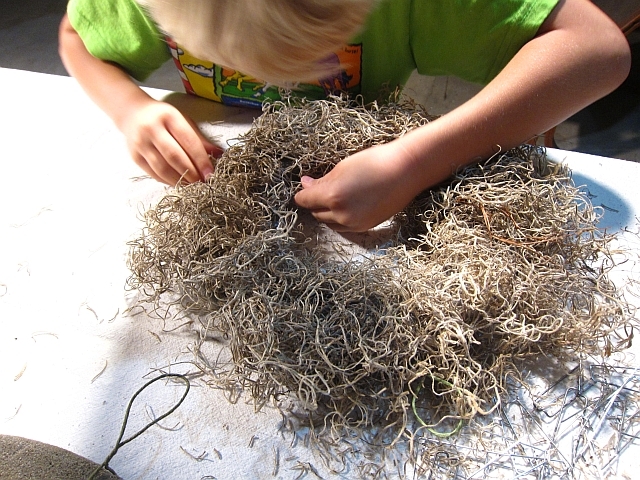 Place Spanish moss on the back of the wwreath to give it a finished appearance. Fresh or dried Spanish moss may be used. 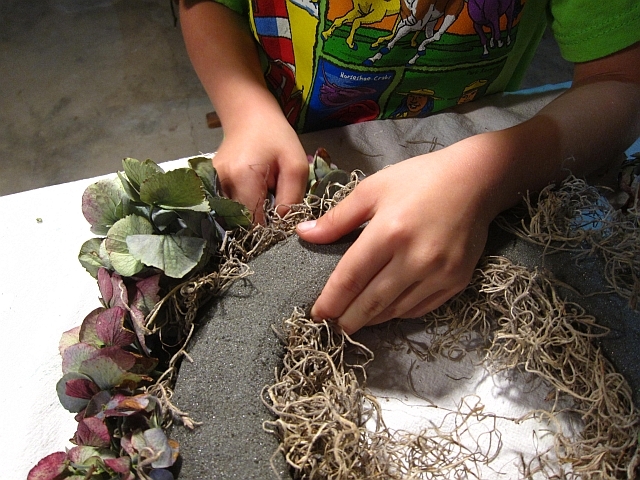 Gently pull apart the moss and secure it with floral pins on the inner and outer edges of the floral form. 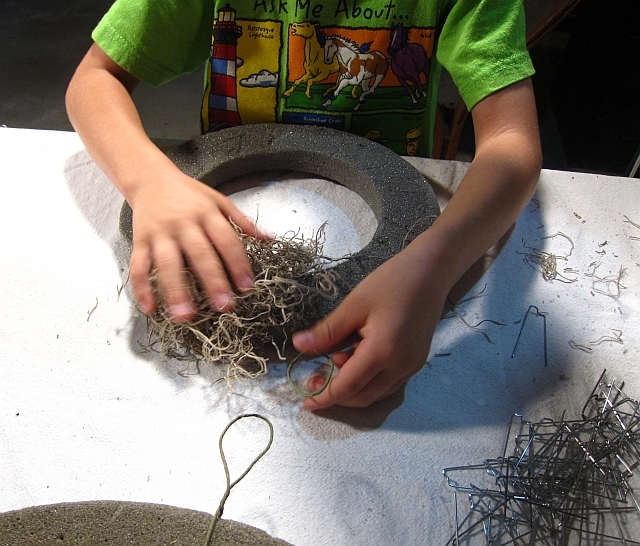 Loosely secure the Spanish moss, avoid placing it in clumps on the form. The moss will gracefully hide the floral form. Cover the entire back portion of the form. After the back is covered, turn the wreath form over so the moss side is on the table. The wreath is now ready for the hydrangea! 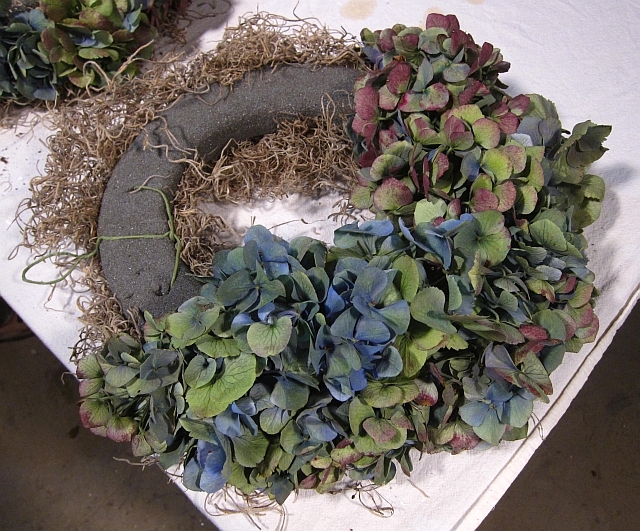 Before inserting hydrangea in the form, clip the full bloom ionto smaller pieces. 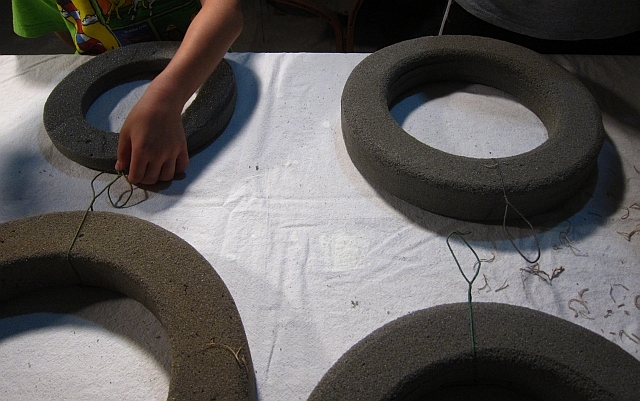 Each cut bloom piece needs a pointy stem in order to stick into the floral form. Fill in the face of the form with bigger pieces and the outer portion of the form with smaller pieces. If the stem of the bloom is too soft and will not stick into the form then attach a floral wire to the stem. 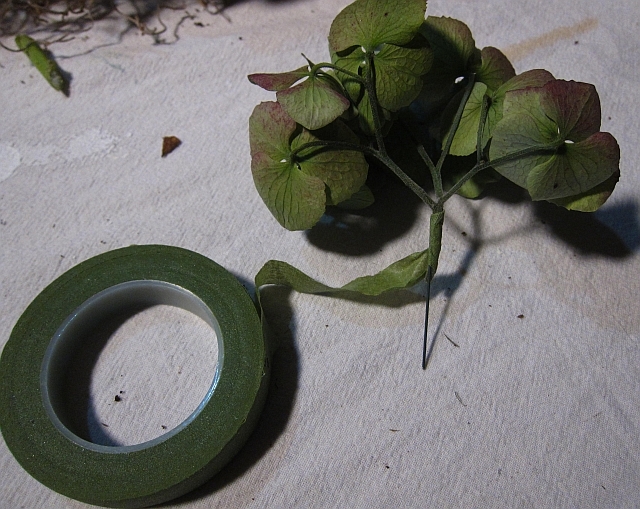 First, twirl a bit of floral tape around the hydrangea stem then place the wire on the stem and continue to wrap the tape all the way to end of wire. The wire slips easily into the form and holds the bloom securely in place. My son’s wreath is almost finished. It took him about one hour and 6 to 8 full blooms of hydrangea to complete his wreath. When you finish your wreath, hang it on the wall in a cool and dry place in your house, preferably out of direct sunlight. The wreath will dry in about 2 days. It is fragile, carry it carefully. TAH DAH!! My son finished his wreath. Awesome how-to post! Its amazing how you got a six year old boy to be gentle and careful!